Place the first 5 ingredients into a large bowl. Add enough dressing to coat as desired. Divide spinach salad evenly onto two plates. Top spinach salad with avocado and serve immediately. Note: While we generally don’t endorse specific products, and we aren’t compensated for our recommendations, we do LOVE the nut mix from Sahale Snacks in our spinach salad. 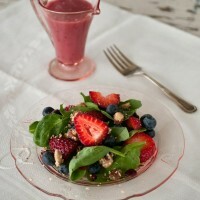 Also, we haven’t found anything we like better on our spinach salad than Marie’s Raspberry Vinaigrette dressing. I remember that Jon and I fought over the remaining salad as all the “goodies” had settled to the bottom of your beautiful glass bowl and were they ever good! WOW!